How can we consider prayer, real and heartfelt prayer, as a new Panacea within reach of everybody in order to accomplish healing, or at least release, to the bodily, emotional and mental suffering of so many people all over the world? The Greek word panakeia means “universal medicine” (from pan “everything” and akeomai “to heal”, “to cure”). It was the name of the goddess who did general healing through plants—Panacea, sister of Hygieia and daughter of Asclepius. Asclepius, son of Apollo, was the god of healing and of the science of Medicine. The Great Initiate Chiron, associated with the constellation of Sagittarius, was his Teacher, but Zeus, the king of the gods, afraid that Asclepius might render all men immortal, slew him with a thunderbolt. “The Rosicrucian Brethren have not one Medicine for a great man, another for the poor, but equally respect both; frequent in visiting, comforters in affliction, and relievers of the poor; their labour is their reward, their pains to them gain”. “When you pray, go to your private room, shut yourself in, and so pray to your Father who is in that secret place, and your Father who sees all that is done in secret will reward you” (Matthew 6:6). According to Mark (11:24), Jesus said that everything we ask and pray for, we must believe that we have it already, and it will be ours. Certain scholars thought that this statement was improbable, perhaps resulting from an error of the copyists, and tried to correct the aorist tense (“we have it already”) into something less definite, as, for instance, “we will have it”. • Second, that the efficacy of prayer is a predictable consequence: strong prayer is an invocation of White Magic uttered by a being made in the likeness and image of God, a being whose body is the shrine of the Divine Spirit: Man. With this splendid and powerful force generated by the engine of prayer, a spiritual Panacea can be created that is within reach of every man and woman who is purified through living the Life. In other words, it is within reach of everyone reformed by a strenuous imitation of Christ and by an untiring endeavor to practice the ideals of Christian Rosenkreuz. We have some idea of the nature of the Rosicrucian Panacea described by Max Heindel. On the memorable night of the 9th of April 1910, when the New Moon was in Aries, his Teacher appeared in his room and requested that he go to the etheric Temple in Germany while a guard was left to watch over Heindel’s gravely weakened physical body. There he was shown certain extraordinary things that he reports in his books, namely in Teachings of an Initiate and Occult Principles of Health & Healing. One of those things was a substance with which the Universal Spirit could be readily combined. Potentiated by the collective thought/prayer of the Brothers, who ranged themselves in a certain pattern and prepared the room with harmonious music, the substance began to glow with a spiritual essence. The resulting Spiritual Panacea thus formed by the Elder Brothers used later used with instantaneous success. Heindel firmly states that the use of this Panacea should be entrusted only to specially prepared Disciples. How many specially prepared Disciples exist all around the world? We know that there are no limits to the Power of the Divine Force. As a little seed can give rise to an immense tree, so can a few Disciples, gathered in deep and mighty spirituality, do prodigious work in the Vineyard of the Lord. Notwithstanding, as modest aspirants to whole knowledge and whole health, we can add to this Universal Healing Power with our contribution. We can do our part to help form the new Panacea. Already, at the 6.30 PM weekly Healing Service, when the Moon enters one of the four cardinal signs in the Zodiac, we direct our thoughts of divine love and healing to the white Rose. In this way we contribute to the healing work conducted by the Elder Brothers of the Rosicrucian Order. But we can do much more, spiritually, to help the sufferers. We can pray, and pray correctly. In his book The Web of Destiny Max Heindel writes that “the subject of prayer is well worth the attention and study of all who aspire to spirituality”. He calls prayer a magic invocation, not a magic formula ! The dangerous error of the low magicians is that they use the powerful instrument of prayer to violate another person’s free will or to gain prominence or material advantages. This is a wicked and wrong use of the Great Cosmic Power. This is profanation. This is Black Magic. Remember the maxim: “I don’t pray to change God’s will but to know how to adjust and align myself to it”. “God is light” (1 John 1:5). “If you remain in me and my words remain in you, you may ask for whatever you please and you will get it” (John 15:7). “Let anyone who is thirsty come to me” (John 7:37). If this is true, if God knows everything that we need, why should we pray to Him for ot? Obviously not to inform Him about what He already knows! Correct prayer is a powerful source of good energy—for ourselves, for worldwide humanity, for all creation. Good vibrations are indeed the ultimate reality in the Universe, part of the Power of God. What, then, is the real usefulness of prayer? If you go to the spring of the Water of Life with a small glass, you may fill the small glass; if you go to the spring of the Water of Life with a large barrel, you can fill the large barrel. Prayer will draw down power proportionate to the intensity and focus with which it is generated. It opens the mystic channels through which will generously flow the always-extant gifts and blessings of our Father in Heaven. This is a mental invocation, commonly used in Eastern Christianity, considered highly efficacious when repeated continuously. It is contained in the words of the penitent publican, contrasted with self-praising words of the “righteous” Pharisee: “God, be merciful to me, a sinner”(Luke 18:13). To pray for anyone who is in an unfavourable or hurtful condition is to shed Divine Light upon her or him; this is indeed a true Spiritual Panacea of great power. Some may counter that ripe destiny is unavoidable, and to pray for persons under such a strong karmic influence is unreasonable, even a waste of time. Not at all! Undoubtedly, our prayer cannot remove the consequence that people must experience as a result of their past deeds; however, by surrounding them in vital waves of love and harmony, by means of our prayer they will be better able to meet any challenge with renewed strength and energy. Two main ingredients compose the Panacea: faith and forgiveness. “My daughter, your faith has saved you; go in peace” (Luke 8:48). “Why do you have these thoughts in your hearts? Which of these is easier: to say to the paralytic, Your sins are forgiven, or to say, Get up, pick up your stretcher and walk?” (Mark 2:9). A correct and efficacious prayer demands not only faith, but also and especially a forgiving heart because, as it is said, “forgiveness is the highest expression of love”. Before praying, we must forgive the offenses we have received from others, but above all we must learn to forgive ourself. We can practice the Spiritual Panacea of Prayer alone or collectively. Max Heindel alerts us to the occult reasons which make collective prayer inadvisable under certain conditions. In The Web of Destiny the author states that collective prayer, if it is be efficacious, must be governed by scientific conditions. The horoscopic influences of the participant worshipers must be reciprocally harmonious. The rising sign—the Ascendant—is of crucial importance. We know that astrologically there are four elements: Fire, Air, Earth and Water. Collective prayer will be more effective if the Ascendants of the participants are of to the same elemental triplicity. For optimum results, not only should the praying group have Ascendants belonging to the same element, say, for instance, to the signs Aries, Leo and Sagittarius (triplicity of Fire). It would also be useful to investigate the reciprocal positions of each planet in the respective horoscopes. But let us start moderately. Let’s begin our collective praying practice with members whose Ascendants belong to the same triplicity. This is only a first step, but it is also the essential one. 1 — Like-minded and properly informed persons who meet in a group and care to participate are invited to write on a piece of paper the zodiacal sign of their Ascendants. 2 — Four groups are formed according to the triplicities of the respective rising sign: Fire, Air, Earth and Water. (a) From the Synoptics (Matthew, Mark and Luke—Rituals of Lesser Mysteries and associated with the elements of Air, Fire, and Earth, respectively), take and read the following episodes: i—Cure of the centurion’s servant (Matthew 8:5-13); ii—The daughter of the Syro-Phoenician woman (Mark 7:24:30); iii—The blind man of Jericho (Luke 18:35-43). Try to find the esoteric meaning. (b) From the Gospel of John (Ritual of Greater Mysteries and associated with astrological Water) pay special attention to the following “sign miracles”: i—The healing of the official’s son (John 4:46-54); ii—The cure of the lame at Bethesda (John 5:1-9); iii—Healing of the man born blind (John 9:1-7); iv—The resurrection of Lazarus (John 11:1-44). Also, try to determine the esoteric meaning. 4 — Compare and discuss the results obtained by each one of the four groups, paying special attention to the different interpretations imputable to the different views influenced by the respective triplicities. 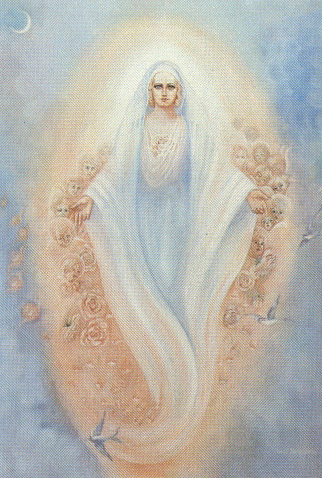 (*) In this symbolical representation of an Invisible Helper, painted by Mary Hanscom in 1937, the artist portrays the etheric or soul body, such as ( according to the Rosicrucian Teachings) a daytime visible helper functions in at night while the physical ody is recuperating from the day's activity. Actually, to etheric vision, the Invisible Helper appears clothed in garments worn during the day. The face of the Invisible Helper was inspired by an experience the artist had when she was nine years old. A countenance haloed in flood of fight apperead to her, and made such a vivid impression that it remained in her consciousness. The Invisible Helper's hands, open and extended, are symbolic of service. The new crescent moon signifies a time when the aspirant can best advance into Invisible Helpership. The birds are placed in the picture to show that the Invisible Helper functions on the etheric level of the Earth plane. The cherubs are indicative of unborn Egos , and thus symbolize the doctrine of Rebirth. Some of the faces were modeled on baby pictures of the secretaries in the Healing Department of The Rosicrucian Fellowship at time the painting was created. As stated in the Rosicrucian Fellowship Temple Healing Service, "the white rose is symbolical of the heart of the Invisible Helper". This painting is in The Healing Department of The Rosicrucian Fellowship at Mt. Ecclesia, Ocianside, California, USA. "When a person is intensely in earnest in supplication to a higher power, his aura seems to form itself into a funnel shaped form which resembles the lower part of the water spout. This leaps up into space a great distance and, being attuned to the Christ vibration of the interplanetary world of Life Spirit, it draws thence a divine power which enters the man or company of men, and ensouls the thought form which they have created. Thus the object for which they have united will be accomplished. But let this be borne thoroughly in mind, that the process of praying or concentrating is not a cold intellectual process. There must be an amount of feeling adequate to accomplish the desired object, and unless this intensity of feeling is present, the object will not be realized. This is the secret of all the miraculous prayers which have been recorded: the person who prayed for something was always intensely in earnest; his whole being went into the desire for this or that thing for which he prayed, and thus lifted himself up into the very realms of the divine and brought down the response from the Father. "